After wrapping up production with the 8 German celebrities and spending the following morning de-rigging the net, we barely had enough time to breath or celebrate before setting off on a 14 hour drive to our next set location of Swakopmund. This beautiful coastal town certainly had a unique German tourist charm, but our next rigging feat would take place no where near the comforts of modern civilization. We hopped in our 4-wheel-drive trucks the next morning, filled to the brim with gear and loaded down suspension, arriving in one of the most barren desert environments I’ve ever seen. Driving at fast speeds over rugged rocks and deep sand washes, along what was named “Fury Road” (since the most recent Mad Max: Fury Road movie was filmed there) we eventually arrived at our new rigging location. 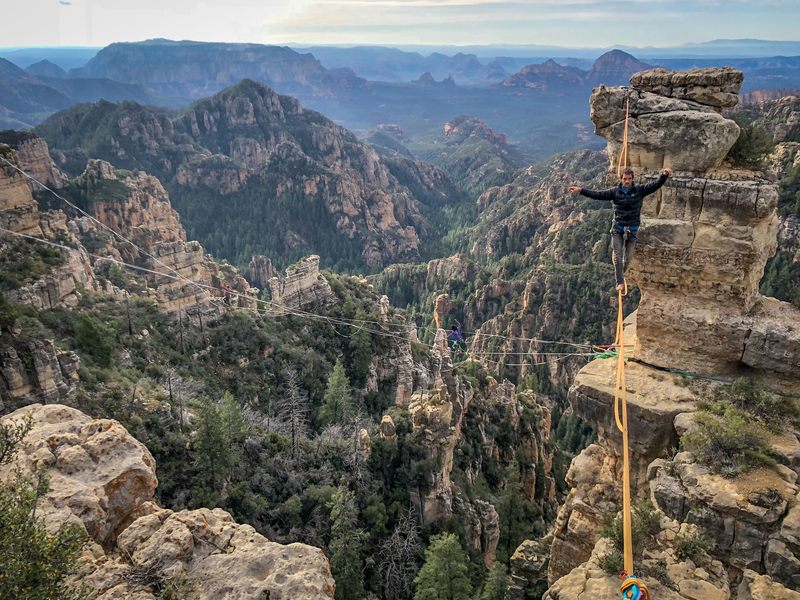 The first step of our next game challenge was to install a 600 foot long horizontal rope (tyrollean-traverse) 120 feet off the desert floor between rock walls. To sum up a complicated rigging design, we created a game where contestants would be pulled along a suspended horizontal set of ropes, while dangling in a full body harness, passing over a series of floating balloon clusters below. Each contestant wore special shoes equipped with spikes on their soles, used to pop the balloon when they made contact with them. Whenever the hanging contestant visually felt like they were above the various balloon targets they would signal to their team to stop pulling them horizontally on the tyrollean and we would release them from the dangling position into an 80 foot free-fall toward the ground. They would attempt to kick the balloons and pop them to accumulate points. With a total of five attempts to pop the balloons, we would repeatedly yo-yo them up and down to the suspended position along the tyrollean-traverse. This proved to be an extremely complicated rigging feat, mostly because the balloons below had to be positioned at a fixed height. The added element of constant wind made this concept exponentially more difficult to keep the balloons stable in space but we created a solution. These facts, in addition to the contestants having to repeat this repetitive up and down process, dropping and raising again and again, made for an exhausting experience for the gladiators mentally and physically. In summary, the game functioned perfectly and we had proven our team worth by continuously adapting to new unexpected issues and persevering through stressful work conditions. After 14 days of continuous and full on travel/rigging we were rewarded with an extra week in Namibia to relax and enjoy. This expedition proved to me that our team dynamic and creative rigging skills could be pushed to new limits and met with new solutions constantly. I learned a lot about my own personal endurance, focus and tenacity in EXTREME heat and under high production stress. All of us grew closer as a team, alongside our new Namibian friends, and we bonded through the trials and tribulations of a hectic work schedule. Thanks to the enthusiastic help of many Namibian climbers, drivers, and staff at our side, an incredible German stunt team and an excellent Global Gladiators staff, we all walked away from the job exhausted and with a new creative resume piece to travel home with.